Nagpur : Nagpur Metro emerged the champions of the first-ever cricket tournament organised within MahaMetro and its contractor companies. The Nagpur Metro 1 team defeated Greatwall by 17 runs to clinch the title. The tournament organised by MahaMetro was played at VNIT grounds wherein ten teams including Nagpur Metro 1 and Nagpur Metro 2 of MahaMetro, Greatwall, General Consultant, D-Beam , NCC, ITD Cementation, Afcon, Siemens and Sterling Wilson. Nagpur Metro 1, Nagpur Metro 2, Greatwall and General Consultant qualified for the semifinals. 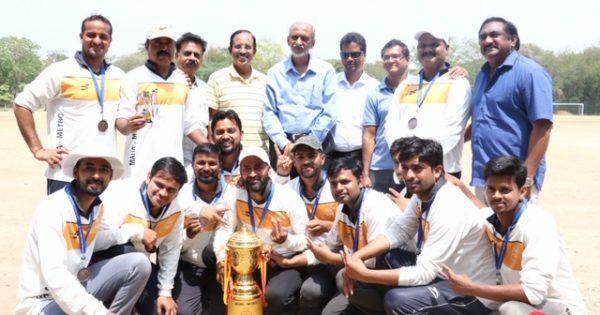 Batting first in the finals played between Nagpur Metro 1 and Greatwall, Nagpur Metro scored 92 runs losing eight wickets in the stipulated 12 overs. For Nagpur Metro, Nikesh and Saisharan were the highest scorers, who scored 36 and 22 runs respectively. For Greatwall, Rupesh Kahar and Akshay Mahulkar bagged two wickets each. Showing brilliant bowling performance, Nagpur Metro bowled out Greatwall for 76 runs. Lankesh Chandere was adjudged man-of-the match of the final match. Similarly, Bhaskar Gawali was adjudged as best batsman, Ankur Gorde as best bowler, Mahendra Swami as best fielder and Saisharan Dixit as best captain. VNIT Dean Pramod Padole and MahaMetro Director (Finance) S Shivmathan presented the winning trophy to Nagpur Metro 1 captain Saisharan Dixit. Chief Project Manager; Reach-3; MahaMetro; Arun Kumar, Project Director; General Consultant; Ramnathan along with officials of MahaMetro were prominently present on the occasion.